Every week, I get my groceries delivered. 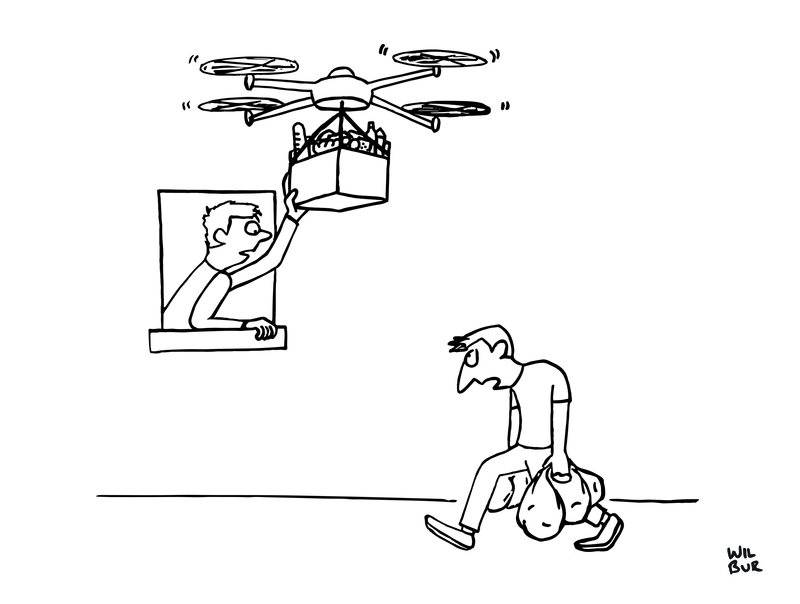 Perched up high on the twenty-eighth floor of a high-rise in downtown Chicago, grocery delivery is a practical choice. But it’s also a laughable luxury. Is it really too hard to patronize one of the four grocers in a four block radius surrounding our building? Is it too much to ask to walk the aisles of food rather than scroll through online images? Is it such a burden to walk down the street with “heavy” groceries using our able-bodies? We are so far removed from the sources of our food that without the slightest hesitation we can click a few icons on a screen at home and the next day a man (yes, it’s always been a man) knocks on our door with bags of fruits, vegetables, and meat. There is no dirt under our fingernails, no long range weather forecast in the Old Farmer’s Almanac, no acknowledgement of nutrient cycles from livestock waste to crop fertilizer. But lamenting the down and dirty of the family farm is hardly relevant. Long gone are the days of tilling the fields and harvesting the season. Today there is not even the friendly interaction with the cashier as we check out at the grocer; there is no shared space in the aisles of what feels like an outdated warehouse experience; there is no harmless banter at the delicatessen counter; nor is there the tactile and fragrant sensation of choosing our own produce. We are, as the below quote states, traveling in boxes (our homes, our cars, our offices, etc.) and “going from one box to another” without the faintest connection to the fundamentals of life. This week I came across a book from 1935 titled Five Acres and Independence: A Practical Guide to the Selection and Management of the Small Farm. What strikes the modern reader is not the level of detail used or the pragmatic nature of the text, but how foreign its contents. Topics like water, soil, crops, and sewage—the essential fabrics of sustaining our everyday lives—are described in terms that, although meant to be familiar, are lost on contemporary urbanites. Loam, humus, baffle boards, pistillate, strawberry runners—my lack of recognition is almost embarrassing. Yet why would we recognize these? Many of us live in a world of concrete and steel, where “agriculture” is performed in far-away places stigmatized as “backward.” The word “landscape” is usually followed by “architecture” or “photography,” rather than reports of water drainage and nitrate levels. We are estranged from the physical world that humans are adapted to inhabit. Technology, even really the most rudimentary technologies, are a double-edged sword. And so the sense of community that we had by going to the grocer more often, by being outside on our front porch because we didn’t have A/C inside the house—that sense of connectedness with our community and our neighborhoods just doesn’t exist anymore. Everybody’s inside their boxes, and they’re going from one box to another. What I believe the cultural shift that’s happening is a reach back to that sense of community. I think the younger generations are realizing that owning more stuff didn’t lead to more happiness; their parents aren’t happier, because they had more stuff or more space. But being connected to people [is different], especially now that you have the tease of having social media making you feel connected but not really.